I've faced so many hardships in life this 2010. So many failures and trials to start all over again. I failed so many times this year but I never surrender and tried again and again. I've lost some friends and those people who are so dearest to me this year but I gained more and more. I can never ever forget this 2010. I've spent my 23rd birthday (last December 7) with my Mommy watching My Amnesia Girl and just strolling the mall. We're still happy 'coz we are together in my very special day. I am a materialistic person (most of the times) but I realized that there are things in this world that can't be measured by these material things. It's nice to know that my Mom's happiness counts a lot for me. Everybody has a wish! I too have so many wishes. On top of it, it's Nokia C7. I am still hoping for a better year to come with the new Nokia C7. I just hope I'll get it for I have been a good boy this year (except when necessary). 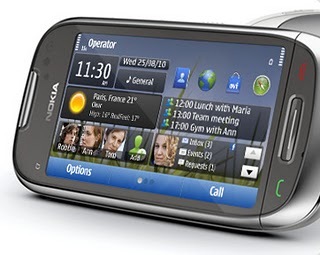 obstacle in reaching your love ones, your friends, and others..."
By the way, Nokia C7 is a fabulist smart phone best for people like me. Also suited for people who loves social networking sites like Facebook and Twitter. Gusto ko rin ng Nokia C7! Hi, I'm new with the blogging community. Can you help me get watchers? advance merry christmas and a happy new year............ ako n95 pa rin..
Nokia C7 is a fabulous gift for your love one. Anyone could enjoy using it because of its wonderful features. It is truly one of upgraded gadgets nowadays.